The show star quality of Las Vegas may have waned but not as far as executive aviation is concerned. At the recent gathering delegate numbers were higher than they have been since 2008, the value of orders was up on recent years, and the value of one single commitment was a true high as Flexjet confirmed it is to purchase 20 of the Aerion AS2 Supersonic Business Jet, a book value of US$2.4bn. See BTN 23 November 2015. If Wheels Up stole the show at the 2013 Las Vegas convention it was Aerion that did so this time round. There is much debate about the likelihood of the AS2 ever flying, and with recent models such as the G650 reaching 0.925 Mach speeds, the need for the dubbed son-of-Concorde is often questioned. However it is a breathtakingly stylish aircraft that is undeniably the transportation solution for the future, for those that can afford the cool US$120m price tag. With anticipated speeds of 1.5 Mach the aircraft is expected to knock literally hours off intercontinental flying times. NBAA buzzed as Chairman, Robert Bass, announced its first fleet order. Flexjet, the fractional ownership business, has committed to 20 of the sleek machine. Ken Ricci, Flexjet Chairman, commented that the business wanted to cover every type of mission its members flew, and the addition of the AS2 to the fleet enabled them to make that possible. Flexjet customers won’t need to buy into ownership, but will purchase access to the jet as required. Champagne flowed after the announcement, which followed hard on the heels of an earlier press conference that firmly aligned Airbus as a technology partner. Brian Barents, Co-Chairman, also said that the facility location, within 200 miles of the coast and a large port, is to be decided imminently, whilst the decision about an engine partner will be made within the next six months, firmly quashing doubts about its likelihood of ever getting off the ground. Following fierce competition between designers and completion houses, Aerion also declared the selection of UK-based DesignQ as the interior designer. A 3D tour of the Aerion interior confirmed that the British designers had once again blended form and function, to create style and purpose. The interiors would be outfitted by INAIRVATION, the recent joint venture between Lufthansa Technik and F/List – Aerion is the first customer on their books. “We are close to a renaissance for civil supersonic flight,” said an excited Brian Barrens Co-Chairman of Aerion. Confounding doubters at the other end of the spectrum, the workhorse King Air 350i has seen Kenny Dichter’s Wheels Up membership-based private aviation club continue to grow. Predicting revenue increases of 50% in the next year, and an 80% rise in flight hours, Dichter is now eyeing European expansion. Having sourced US$115m from a group of investors, he expects to set wheels down in Europe early next year with operating partner Gama Aviation. Dichter notes that the Wheels Up model allows a greater number of potential passengers easy and affordable access to the benefits of business aviation. Two years ago many comments were made about passengers not wanting to ride King Airs, as of today Dichter has 2,000 members, 200 of which are corporates. Doubters beware in business aviation. Other orders were in the offing too. Not content with just the supersonic order Flexjet also announced an MOU to buy 20 of the increasingly popular midsize Bombardier Challenger 350s, in a deal valued around US$540m. MGM International Resorts, one of the stalwarts of Vegas, signed Letters of Intent for three of Embraer’s leggy Lineage 1000Es, and three midsize Legacy 500 business jets. Valued at US$200m the aircraft will be used to fly the company’s VIP customers. New models were welcomed as Textron unveiled its Citation Hemisphere concept. The 8ft 6” width of the cabin makes it the largest in its class and thanks to its 4500nm range makes it a serious contender with the G450. It was also showing off its Longitude with a ground test article, which whilst looking like the real thing, has been used to formulate machine tooling for the final product, and will never actually get off the ground. Gulfstream used the occasion to fly in its eagerly anticipated G500. Hondajet since confirmed the award of a FAA full type certification with the first delivery expected shortly. It has one hundred orders on the book, and 25 aircraft in various stages of construction. 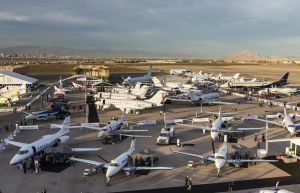 In a magical town like Vegas it’s hard to know what comes next but Honeywell Aerospace, in its annual business aviation forecast, indicated that whilst business aviation was emerging from the doom and gloom of recent years, significant growth is not expected for another couple of years. However Honeywell anticipates that, new models, upgrades, fleet renewals, and an improving US market will underpin longer-term recovery with an anticipated 9,200 jets being delivered by 2025. A sprinkling of stardust drifted onto the show as Captain James T. Kirk, Hollywood legend William Shatner, beamed in to sample Bombardier’s new WAVE (wireless access virtually everywhere) inflight connectivity on a Bombardier Global. Country and Western singer Dierks Bentley spoke to delegates advocating the switch from tour bus to Cirrus Single engine for travelling between performances. 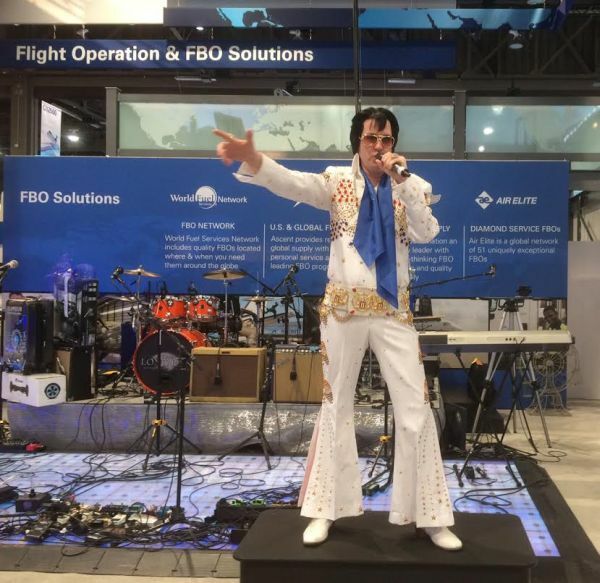 He argued that the use of business aviation saves time, gives him and his team more time with their families, and helps them play their best ever music.